SCORM or xAPI (Tin Can) - Get the Answer! image/svg+xml image/svg+xml image/svg+xmlimage/svg+xmlimage/svg+xml SCORM or xAPI (Tin Can) - Get the Answer!SCORM or xAPI (Tin Can) - Get the Answer!SCORM or xAPI (Tin Can) - Get the Answer!SCORM or xAPI (Tin Can) - Get the Answer!SCORM or xAPI (Tin Can) - Get the Answer!SCORM or xAPI (Tin Can) - Get the Answer!SCORM or xAPI (Tin Can) - Get the Answer!SCORM or xAPI (Tin Can) - Get the Answer! In use for more than a decade, the term “e-Learning” includes a wide range of information technologies and digital methods at use in schools, universities and commercial organizations of any size. There are two main standards that are widely represented and adopted by e-Learning vendors. Meet SCORM and xAPI (/Experience API/Tin Can API). The most widely used e-Learning standard is definitely SCORM. If a Learning Management System (LMS) is SCORM compliant, then it can play any SCORM course created with any SCORM publishing authoring tool. Similarly, any SCORM course can be imported and launched in any SCORM-compliant LMS. This interoperability makes this standard universal and saves a lot of time and money for implementing e-Learning in everyday practices. Nowadays, e-Learning is rapidly moving towards m-Learning or mobile learning, as more and more students prefer to access materials from their mobile devices for obvious reasons. The xAPI (read Experience API) standard was created to meet those ever-evolving needs. Formerly known as Tin Can API, xAPI records literally any learning experience and every learner’s step, wherever and however it’s made. Instead of seeing just a piece of the tracking puzzle, xAPI gives you the ability to see the whole picture of the e-Learning process. Let’s take a closer look at what SCORM and xAPI are, how they differ, and for which scenarios they work best. SCORM is a technical standard that guarantees the compatibility of SCORM courses and enables their multiple usage. Whatever LMS you use, it’s constantly changing: you add media files, create new courses and tests, and invite new users. SCORM is what unites all of those elements. It remains “invisible” for the ordinary user. However, it appears to be the most important part of e-Learning. In other words, it’s a universal technical basis for the majority of e-Learning systems. You can learn how to make the most of SCORM by reading a simple guide on creating and playing SCORM content. However, SCORM can only be used in a certain environment (LMS) and is useless if launched from a local storage device or integrated into a standard WordPress website or blog. You’re developing non-traditional online learning that involves gamification and other non-linear scenarios. In 2010, when SCORM was about 10 years old, ADL, the keepers of SCORM, issued a call asking what the next generation of SCORM could look like. In reply, Rustici Software gathered a wealth of valuable information by analyzing SCORM and interviewing customers and key players in the industry. This new ambitious project led to the release of the Tin Can API version 0.9. The development of the specification then passed from Rustici Software to an open community shepherded by ADL. The specification development group worked hard to produce version 0.95, which was much closer to the version we see in most LMSs today. Even the early beta releases saw success and were widely adopted, creating a solid base for the release of version 1.0.0 in April 2013. Learning is happening everywhere, not just in traditional SCORM courses and traditional LMSs. To continue the learning process in a typical Web environment, xAPI comes in handy. You may wonder if it provides users with all the capabilities of SCORM. Yes, it does cover all the cases where SCORM can be recommended, but not only. xAPI can also be used where SCORM is likely to be a weak point. xAPI was created to be the nextgen version of SCORM, but in practice there are too many differences between them. xAPI enables the tracking of all learning experiences and steps made by learners when exploring, whereas SCORM is designed to be used for packaged quiz-based e-Learning courses. As stated above, SCORM requires using a SCORM-compliant LMS. This way, courses can communicate with the system to track user activity and course completion. xAPI works differently. It can be launched as a general hyperlink placed somewhere on the Web, can be launched locally with an active Internet connection, or opened in a specifically developed client application even offline to get synced when the connection is reestablished. LRS and LMS: What’s the difference? While xAPI, Experience API, and Tin Can mean absolutely the same thing, the difference between “LMS” and “LRS” is more than just one letter. An LMS (Learning Management System) is a platform deployed to work independently within itself. An LRS (Learning Record Store) can be a part of an LMS or it can be a separate program. It’s a database where all the user steps are communicated right away or after synchronization with the server (like the Gmail app does when your smartphone gets connected to WiFi). An LRS is used in conjunction with xAPI to collect, store and retrieve people’s learning experiences. The moment an xAPI course is launched, it starts to communicate with an LRS. It is not necessary to import xAPI courses into a specific sandbox: just make sure that an LRS can listen to course statements. To understand how xAPI courses created with iSpring communicate with an external LRS, read the tutorial on How to track iSpring Tin Can API course statistics using Cloud SCORM.com. 1 – Many LMSs do not parse cmi.interactions.n.id for SCORM 2004 quizzes, and SCORM 1.2 is not designed for essay questions. 2 – Most LMSs do not have mobile apps that are compatible with SCORM. 3 – Many authoring tools do not have good HTML5 support to create SCORM courses for mobile devices. 4 – It depends on where the content is located. 5 – To establish a connection with an LRS, an Internet connection is required if xAPI courses are launched in a browser and not in a specially designed application. Many organizations and online platform vendors already have libraries of SCORM based courses that they want to continue using. Yes, SCORM is old, but it is not that bad and will work for many years to come for organizational trainings and collective webinars. At the same time, xAPI is good for both old and new platforms which are ready to adopt this specification to extend their audience. xAPI courses can be taken anytime and anywhere, saving learners from being stuck to their school desks. That’s why xAPI is especially great for personal on-the-go training. 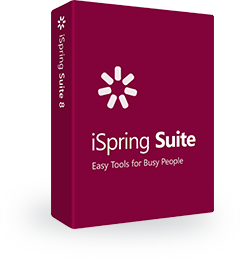 If you haven’t decided yet which of these standards would be the best fit for you, try the iSpring authoring tool, a universal solution that allows publishing courses to both SCORM and xAPI (Tin Can). With SCORM being the e-Learning past and xAPI the present, the future may belong to the innovative cmi5, which consolidates the best of the two standards.